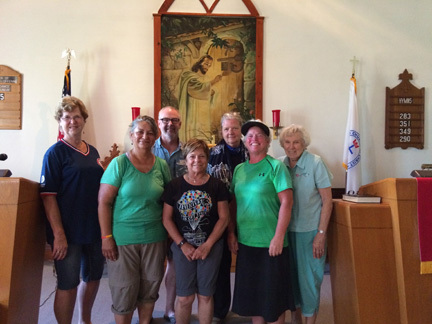 On Thursday evening, May 22, five pilgrims walking the Katy Trail in honor of the achievements of St. Rose Philippine Duchesne were welcomed at St. Paul’s UCC in Defiance and spent the night in a parishioner’s home. St. Rose Philippine Duchesne, a nun in the Order of the Sacred Heart, founded The Academy of Sacred Heart in St. Charles, Missouri in 1818. All her life she had longed to work with Native Americans. Finally, at the age of 72, she was allowed to travel to Kansas where she started a school for the Potawatomi Indians, who called her “the lady who prays all the time”. She spent a year in Kansas before returning to St. Charles where she died in 1852. A foot pilgrimage was organized last year by the Society of Servant Pilgrims, headquartered in Denver, CO, to honor the 200th Anniversary of St. Rose Philippine Duchesne founding of The Academy of Sacred Heart. The Pilgrimage started at the Shrine of St. Rose Philippine Duchesne in Mound City, KS and will conclude at the Shrine and burial site of St. Rose Phillipine Duchesne at The Academy of Sacred Heart in St. Charles on May 24th. Four ladies have walked the entire pilgrimage thus far, from its beginning on April 29: Ann Sieben-Coordinator, from Denver, CO; Maggie Finefrock from Kansas City, KS; Anne Rutledge from Holland, MI and Patt Bekken from Hillsboro, OR. Two other women had joined them for about a week (because that’s what their schedule allowed,) and Vince Baker from St. Peters, MO met the group in Jefferson City and completed the rest of the pilgrimage with them. Ann Sieben works for The Society of Servant Pilgrims, a Catholic Association from Denver with the understanding that “love your neighbor as yourself” is a directive for action. The role of a Servant Pilgrim is to go out and meet the neighbors of the world, and in so doing, build trust, which is the foundation of peace, by traveling on foot from village to village as a demonstration of faith, and with the intention to meet and engage people, where and when they are encountered. The act of pilgrimage on foot to a sacred destination provides an experience unique to each pilgrim, with opportunities for quiet contemplation, spiritual reflection, and social interaction. This simple, fundamental act, despite the inherent vulnerabilities and sacrifices, is an act of building trust between individuals. It invokes the Biblical promise – to ask and to receive; to seek and to find; to knock and to have a door opened – every day. Throughout the 26 day journey, the group seeks shelter each night, usually at a church, but sometimes at a community building or private residence, and relies on the hospitality of people in those communities to provide a meal. Occasionally, as was the case in Defiance, the pilgrims are invited to eat, sleep and shower in private homes – which is an appreciated luxury. Prior to spending the night in Defiance, the group slept at St. Vincent de Paul Catholic Church in Dutzow on the 21st. Coordinator Ann Sieben has been a life-dedicated pilgrim since 2007. She has extensive experience taking pilgrimages all over the world (44 countries), and when not leading a group, often strikes on her own – completely alone. In the winter of 2015-2016, she trekked 2,000 miles from Colorado to the Shrine of Sainte-Anne-de-Beaupré in Quebec, Canada. With little more than the clothes on her back, she walks with a handful of items in a small pack, and has received hospitality from countless strangers-turned-family, all around the world. It’s important to note that true pilgrim carries a Record of Passage that get signed or stamped at each overnight host, which helps document and authenticate a true pilgrim as opposed to a drifter/vagabond. A pilgrim also has a specific destination in mind – usually a sacred or spiritual site – because the purpose of the pilgrimage is to promote trust and peace. As a coordinator for the Society of Servant Pilgrims, Ann helps people complete pilgrimages by planning the routes and making arrangements for overnight stops. Her method of doing that is often to explore a route first on her own, then later accompany a group back along the same path. A second pilgrimage honoring the 200th anniversary of St. Rose Philippine Duchesne will be held this fall. It will start again in Mound City, KS and follow the same route except for the last two days. It will conclude in St. Louis for a special, large celebration of her feast day on Nov. 18. “The world needs more pilgrims!” says Ann Sieben. For more information, visit www.societyofservantpilgrims.com. Ann Sieben-Denver, CO; and Mary Behr (St. Paul’s UCC).